Thank you for your question, Gayle. It is not clear to me how you have been practicing self-protection prior to your Reiki training, and if you were told you should no longer practice that technique. So, I am not able to comment on your practice. But, I am happy to explain how Reiki provides self-protection. One understanding of the protection Reiki attunements bring to a practitioner is concerning the special properties of not absorbing your client’s energies. For example, if your client is experiencing grief, due to the death of a loved one, the Reiki practitioner does not take on these grief energies. The practitioner may “feel” the energies, but she does not become a grieving person herself. A number of healing arts practitioners from other modalities report they absorb the energies of their clients; with clear intention, Reiki protects us from that possibility. I have met some healing arts practitioners who use such practices as wearing silver jewelry, using sage, reciting specific mantras, etc., for self-protection. The intentions behind these practices are the most important factors and these techniques may work. As long as a practice is set with loving intention and not causing another person harm, I do not view it as a conflict with Reiki ideals. In addition, Reiki can provide another way to protect ourselves all the time, as Reiki connects us so easily to Universal Life Force energies. If you go into work every day surrounding yourself with these energies, you will be protected. You can develop a daily routine, where you set the intention, and give Reiki to yourself. The energies from other people (including their thoughts, beliefs and actions) can affect us greatly. But, with the loving and light-filled energy of Reiki, these negative energies will not be able to enter our individual energetic fields. Each of us has a responsibility to nurture and care for our energetic fields; eating healthy, sleeping enough hours, and protecting ourselves in this toxic world are important habits to incorporate into our lives. Gayle, I wish you the very best in this difficult work situation. Reiki can be a great help to you! Gayle, I am a certified Reiki Master/Teacher in the Usui Tibetan Ryoho lineage and I am also a Primus Activation Healing Technique Practitioner from the Crystalis Institute with Naisha Ahsian. I was also taught in my Reiki studies that it was not necessary to protect oneself from the client’s maladies. After taking courses from the Crystalis Institute with Naisha Ahsian, I absolutely do not believe that. In order for a practitioner to remain unaffected, their energy must be heart centered and of the loudest vibration. The practitioner must also be present in the healing session at all times. Per the Law of Resonance, we align with the energy that is of the loudest vibration, which certainly may be that of another person. If you would like more information on this fabulous technique, search http://www.crystalisinstitute.com. It is quite possible to remain in a Primus state and be unaffected by negative energy. If you do anything, with protection ..just do it with the usual pure intent of love..Really Reiki lovers Anything with pure intent and love cannot counter act or diminish your connection or spirituality, they blend All is accepted IF put out there with pure intent and Love. Do your protection witch style & try sending out pure thoughts to the uncomfortable person that they will receive selflove and use the pink protection bubble. BUBBLE them and yourself. This is not Against them but to realign all negative vibes into positive. Witch to Witch Blessed Be. Thank you for your input, Karen and AuraRainbow. All of us have something to contribute to this wonderful world of energy work.There are many ways to provide self-protection! Gayle: I am a Reiki Master, Light worker and channel. 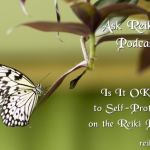 If I understand your question correctly, you are concerned that while on the Reiki path that you are not ever allowed to self protect i.e. : on a day to day basis or with a client. Once our vibrational levels are changed through attunement we are open and or more sensitive to others energies. My first Reiki Master laughed at me when I told her I was having concerns with darker energies, etc. I found help through other more open minded Reiki masters and my channeled guides. These are protective measures you or anyone can try. 1 in morning shower –ground yourself and wrap yourself in protective light. If you don’t shower just do it when you get up. 2 carry or wear selenite (not Satin spar ) or black tourmaline or turquoise or blue sapphire. 3 at work along with the above with an Intent, close your Solar plex. 4 use your mind to sift away that which doesn’t belong to you. 5 use the Let it go technique… If someone’s words/actions are affecting your peace identify the problem and say ” I let it go ” 3 times. 6 call in Arch Angel Michael and his four warrior angels to surround you, to remove all that does not belong and then to fill with pure love, pure light, pure energy, pure healing. If you remove negativity you must fill with light/Love. Never leave a void. 8 as a witch you can also trace a pentagram in a circle on the floor under your desk with your foot. 9 Should you find yourself in a place where you feel especially vulnerable to negative vibrations (a person who is always in conflict, emotionally draining, etc., ) You can Ground/Surround/place a Raku in your own Aura. Never place symbols upon another, never affect another’s free will without their permission.